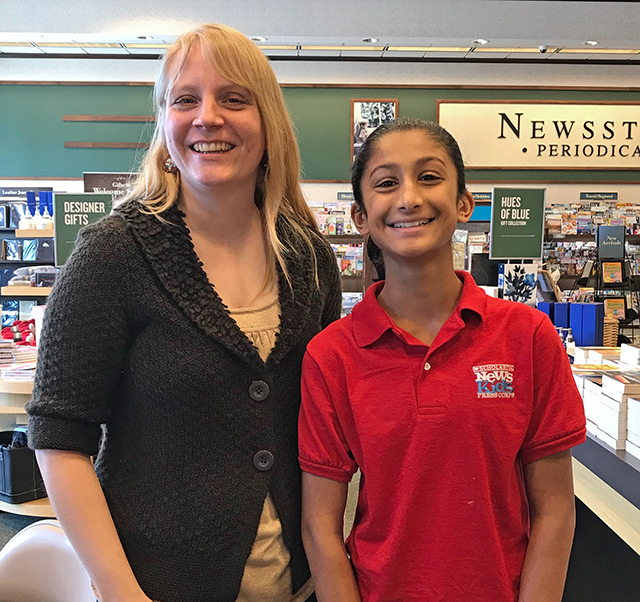 Advice for Teen Writers: “Go For It” | Kid Reporters' Notebook | Scholastic Inc.
“I was about 26, and writing was a second career for me,” said author Jill Williamson during a recent interview in Portland, Oregon. Williamson was at Barnes & Noble on June 30 to promote her latest novel, King’s Blood (Bethany House Publishers, 2017). It is the third and final installment in her Kinsman Chronicles series. Williamson has written several novels in the “speculative fiction” genre, which combines such elements as fantasy, time travel, science fiction, and the paranormal. Williamson co-hosts a blog called “Go Teen Writers,” which encourages kids to write and publish their own books. In 2016, when the blog held its annual #WeWriteBooks contest, Taylor Bennett of Oregon won. Now 17, Taylor has just published her first book, a young-adult novel called Porch Swing Girl (Tradewinds, April 2018). It centers around a 16-year-old who is stranded in Hawaii after the death of her mother. “I’ve been telling stories ever since I learned how to talk,” Taylor said at Barnes & Noble, where she appeared with Williamson. When Taylor was a small child, she would ask her parents to write down her story ideas. As she got older, she began to write the ideas herself. When the budding author started to search for the kinds of books that she really wanted to read, she couldn’t find them. She realized that she’d have to write them herself.